Have you ever had your house remodeled? If so, you know that it can turn your world upside down. The entire house will be stripped bare and it will be replaced with new beautiful siding. The downside is that the house is a complete disaster, while the upside is that the house is going to be amazing once it is done. So, if you put up with a little dust, you get a remodeled home. It's a fair exchange. In honor of the revamping of your home, it would be great to feature a few home-inspired cross stitch patterns. A cross stitch sampler of your first house or maybe even the one that will be with you forever. MarNic Designs creates custom patterns for homes. You simply contact her, send her the picture and she will work up a pattern for you. Easy Peasy. It will cost you but isn't it worth having a custom pattern of your own house. If you are feeling a bit more adventurous, you can try making the pattern yourself. There are several pattern making programs out there, and some are even free! MyPhotoStitch.com is just one example; don't be scared to try it, even if you are new to cross stitching. Give it a try and create a beautiful piece of art. It used to be that Home Sweet Home samplers were corny but there are so many examples that are updated and fun that you can find one in any style now. 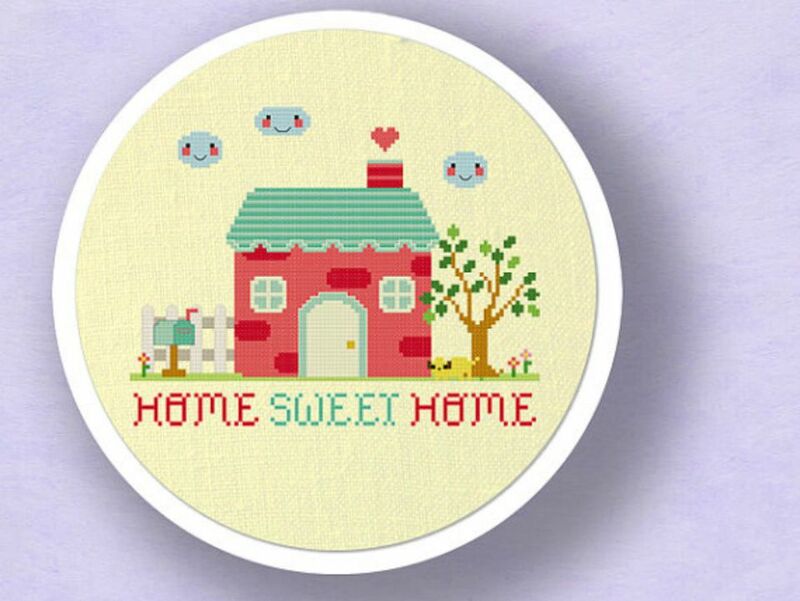 Andwabisabi created this cute whimsical Home Sweet Home pattern that would be perfect for a little cottage. ​This pattern is a reminder of cartoons where the house is alive and falls in love with another house. Remember those cartoons? The colors in this pattern are so pretty and bright, but you can change them up to fit your style and favorite colors. If you are looking for something a bit more traditional, Tereena Clark has you covered. You can purchase this pattern and get instant gratification by downloading it right then and there. There are so many different styles of houses. Helen Smith has the greatest take of different styles of houses. Home Sick, Home Grown, and Home Made are just a few of the plays on the normal house. Make an entire neighborhood with these patterns. It would also be fun to do a dorm room, your first apartment, and your first house. Kind of a history of you and where you have lived. This tongue and cheek pattern is perfect for the science fiction horror fan. It would also look great in the office of your favorite English professor. It will scare off the faint at heart. ​Hardcorestitchcorps offers up Melita Curphy's pattern for purchase.